In a fairly radical departure from the principles that normally govern hydroelectric power generation, Austrian engineer Franz Zotlöterer has constructed a low-head power plant that makes use of the kinetic energy inherent in an artificially induced vortex. The water's vortex energy is collected by a slow moving, large-surface water wheel, making the power station transparent to fish - there are no large pressure differences built up, as happens in normal turbines. Special turbine collecting vortex energy - Image: zotloeterer.com. The aspect of the power plant reminds a bit of an upside-down snail - through a large, straight inlet the water enters tangentially into a round basin, forming a powerful vortex, which finds its outlet at the center bottom of the shallow basin. The turbine does not work on pressure differential but on the dynamic force of the vortex. Not only does this power plant produce a useful output of electricity, it also aerates the water in a gentle way. Indeed, the inventor was looking for an efficient way to aerate the water of a small stream as he hit upon this smart idea of a plant that not only gives air to the medium but also takes from it some of the kinetic energy that is always inherent in a stream. Of course the use of water vortices has been pioneered by another Austrian - Viktor Schauberger, who was also known as the "water wizard". He floated hard-to transport heavy logs from remote regions of the Austrian forests, not accessible at the time by streets, to where they would be milled and processed. The feat was accomplished by carefully regulating the water's temperature and by inducing a rolling, longitudinal vortex motion in the water. At one point, Schauberger took out a patent on a turbine he invented, that made use of vortex dynamics. An article about that turbine of Schauberger's which I wrote way back in the 90s can be found here. The turbine wheel was designed in the form of a cone with a cork screw pattern, and it was fast running. Quite different from the turbine of Zotlöterer which is optimized for aerating the water, rather than for production of power. Still, Zotlöterer's results are quite respectable. The cost of construction for his plant was half that of a conventional hydroelectric installation of similar yield and the environmental impact is positive, instead of negative. Inlet with overflow and vortex basin during construction - Image: zotloeterer.com. 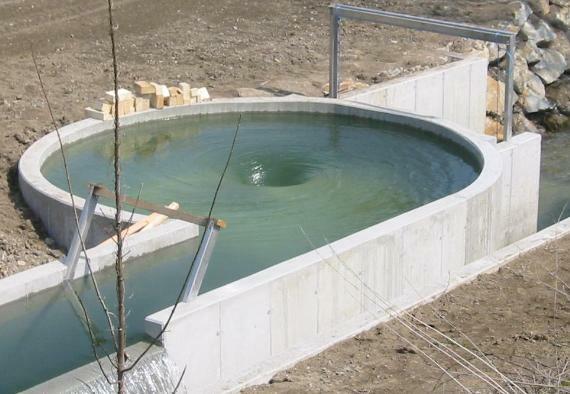 The diameter of the vortex basin is 5 meters. The head - difference between the two water levels - is 1,6 meters. The turbine produced 50.000 kWh in its first year of operation. The complete installation - IImage: zotloeterer.com. Interview - Franz Zotlöterer - Zotloterer Gravitational Vortex Power Plant - low-head power plant that makes use of the kinetic energy inherent in an artificially induced vortex. The plant can be installed with a water drop as little as 0,7 meters. I have long been partial to vortex-based technology. Here are two of my early articles on use of this technology in a hydroelectric power context. Herbrand, an electrical engineer in Germany, relates a story from his youth about a turbine installed at the Rheinfelden power plant (on the Rhine river, not far downstream from Lake Konstanz) that was much more efficient than other equipment before and even after it. The article explores a possible solution to the riddle. Another article on water power, analysing the principle of the use of the dynamic forces inherent in flowing water, which is an important component of the total energy obtainable from the downstream flow of water. An important recognition expressed in the article is the fact that vortices are able to give direction to normally chaotic thermal energy and thus convert it into motion, into a dynamic force, a concept pioneered by Viktor Schauberger. This invention by a Swedish engineer transfers the principle of the water vortex on its head to use air as a working medium - neat. "Air hitting Energytower is led into it and accelerates as the tower's inner radius decreases. Inside the tower, a vertical-axed three-blade rotor starts to rotate. The accelerated air increases pressure and temperature along the inner walls of the tower, generating a relative pressure drop in the middle of the tower - the eye of the tornado. The pressure gap creates a chimney effect in the tower which also adds to the rotation of the rotor. The low pressure in the middle of the whirl enables a fast release of air from the tower whereby new air can be taken in." Whirlpools created by currents as they flow over obstacles are powerful enough to tear apart bridges and offshore rigs. So why not use them as a source of renewable power? 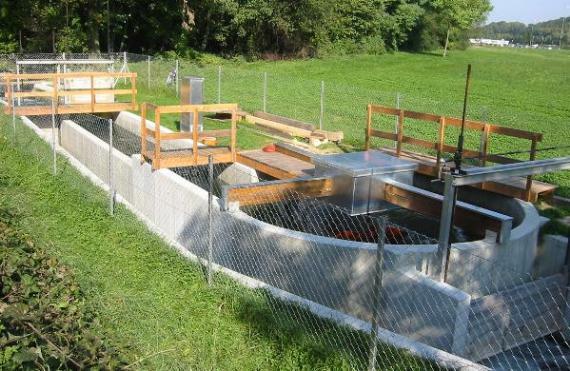 Now researchers led by Michael Bernitsas at the University of Michigan, Ann Arbor, are preparing for the first outdoor trials of a technology that makes use of the slow-moving currents down rivers and across the ocean. So research on using river whirlpools is starting. Interesting. Perhaps someone trying to advance this particular technology. The article is in New Scientist, unfortunately only accessible to subscribers. If anyone knows of an alternate link, please tell. Pico Hydroelectric Generator in 5 gallon bucket developed by Sam Redfield and tested at La Florida in Guatemala. The generator is meant to be a very small, cheap, low impact generator designed to be used with existing gravity fed irrigation, fresh water, or waste water systems. I designed and am in the process of prototyping one cylinder/piston pressure multiplier River flow water pump. It is a submersed water pump for river flows working only with the river flow. We can fabricate simple machines in Angola, and cylinder/pistons assembly is easy. Two cylinders, one with 1 meter diameter and the other 0.2 m/diameter. Pistons are on the same shaft. Area ratio is of 25 X. Pressure ratio of 25X. The bigger cylinder has a diffuser of a diameter of 1.5 meter on both ends and is open on both sides. When we submerse it in the river flow, the water flows in and pushes the piston. On the other end of the cylinder the water flows out in the direction of the river flow. It is a shrouded cylinder with a diffuser and two half diffusers, like impellers to move the system around. The piston pushes the second piston, in a closed cylinder (0,2m/d) and pressures water. The inlets and outlets of this double side cylinder have retention valves to control aspiration and discharged of the cylinder. The cylinders rotate on its axis, enabling continuous cycles. With a 1 m long, 0,2 m diameter pressure cylinder it will pump 15.000 liters/hour, 360.000 liters/ day up to 50 meters high, only with river flow velocity of 1m/s. If instead of pumping water for a storage tank, we pump it to a micro hydro turbine electric generator in the margin of the river; we can produce up to 10Kw. Very interesting. Is this technology ready for market? I would like to see the theory of operation. It appears that by transferring the motion of the water from linear to circular, the turbine can collect the energy more efficiently than a simple straight paddle wheel. Philip. Very interesting. Thought you might find it equally interesting to know that such 'mills' were made, here in the mountains of western NC for the production of mechanical energy (grinding) for centuries before the electrical era, where the 'fall' was insufficient for an overshot wheel but there was good volume to work with. They were called "tub mills". if you mean by "ready for market" that there is someone offering to build you one of these, it isn't. The pictured installation is experimental, and it functions, but there is no builder who is offering the complete thing - as yet. Nothing to keep any enterprising spirit from copying though. This is really cool, and very inventive. There is a natural vortex formation in New Hampshire, quite popular, called The Basin, which demonstrates this very phenomenon (only one turn, and it is pretty dramatic), but no one, up to now, ever thought of harnessing it. Brilliant. What is thge generator size and the volume rate of the water? GPM or liters/min? the volume of water flow is a maximum of 1.3 m3/second. generator size: a test was done with an 11 kw generator, with which a maximum output of 9,5 kw was achieved. currently the installation mounts a smaller 7.5 kw generator, for more easy optimization. current max overall efficiency is 73 % at .8 m drop and a throughput of 850 liters/second equal to 4.8 kw electric power and 6.6 kw hydraulic power. I wonder if someone could publish the drawings and spec's for the generator? Well the maths seem to stack up - bloody amazing no-one else has actually thought to harness the phenomenon before. But I guess that's what makes this so cool - it's obvious once someone has pointed it out. Good luck! Unfortunately I don't know any financiers that could help with this kind of project. The water vortex driven power plant is certainly an innovative system Using the kinetic energy of the inflowing water to the round basin, retaining this energy through artificially created vortex motion is an efficient sytem. I recall having read your article "Understanding Water Power" and Herbrand's discovery. Here too in the more efficient power plant the kinetic energy of the stream -water inflow is retained in the vortex motion, unlike in dams where the inflow energy from the river water is lost. Thus, the plant with dam is not as efficient as argued in that paper. yes, the innovation is really the efficient use of the kinetic energy of the water, which even gets increased in a vortex that flows out of the round basin. While a dam uses exclusively the pressure differential (never the kinetic energy) of the water, this system can be applied everywhere there is a good flow of water and a moderate altitude differential. It opens rivers that today are not usable for hydroelectric power generation to being utilized, while at the same time improving the quality of the water by aeration and by stabilizing the water's temperature. Any possible way to get a more detailed working plan? Is there any gear reduction or is it direct drive? This is still in the prototype stage. No detailed working plans, as things are being worked out. have you seen and verified the claims of this invention or re invention of the tub wheel, common small tests on water vortex usually wrecks the vortex when any impedance is put in the water, is size what allows the vortex to have harnessable energy? the information we have is from the original site in German language. What allows the vortex to have harnessable energy is the size and form of the tub, as well as the fact that the vortex is continually fed by the stream and drained by its central drain hole. Your location sounds perfect. You have more head and more water than the Austrian engineer who made this plant. His is actually working and produced 50.000 KW/hours in the first year of operation. You might get more than that. Do not know what countries his patents cover, or how accessible he is to direct contact in English language. No one else, to my knowledge has tried this configuration in North America yet. True not all water has to be used for the turbine. If you check out the second photo on this page, you will see that there is an overflow before the water actually hits the tub. So although the turbine is of no harm to fish due to slow running, fish can also bypass it altogether using the overflow water. This looks very interesting to me. We have about one mile of 48" irrigation ditch running through our property. There is approximatly 500cfm. I would like additional information. It may work out that I could build something into the irrigation system that gives me power. can anybody give me a helping hand? we try to make the rotor in a different way, meaning in unconventional materials, e.g. carbon fiber. it seems to offer the same resistance response like metal, but the cost are lower. the time life it will never be the same, but, who knows, it can be more afordable for end users. To me this is in the right direction, but still childish, in the baby-face. Viktor Schauberger Spent his whole life studiying this fenomenon. And the vortex is simply not round, it's egg shaped, and you loose tremendus amaount of energy trying to force water to behave like that. hi mr. sepp we also have an uncommon place. i still asking for a little help in the following: may we speak about about a big power generator (more than 35kW) and a turbine make of in some unconventional materials lyke charbon fibre? thank you, i will wait for a contact. system that has a low flow rate, and uses vorticies to enhance efficiency. I'm talking about a small head of water, and water pressure of up to 1 bar, with a flow rate of maybe 9 meters per minute. I'm currently building a small conical Schauberger turbine to test, and wonder if this system could be scaled down to a similar scale? Also, where could I find a slightly more detailed plan of this system. My interests are purely experimental. Many thanks. How about the other extreme? I am working on a system that has a low flow rate, and uses vorticies to enhance efficiency. My property is on a wide stream which I cannot dam or impede, but it does have reliable year round flow. In winter it freezes over so a surface mount system will not work. Could this vortex possibly be turned on its side, vertical to horizontal, and operate beneath the surface? I've thought of using a conical shaped device to increase kinetic energy but this vortex type system may work to increase velocity. What a blessing it was to encounter your data on water power. In working out the theory for my son's 6th grade science project, we were having trouble finding data to support that velocity was actually creating more energy in a small homemade hydroelectric generator set up. The only variable was changing a water supply from garden hose to garden hose w/nozzle. Of course, as we now understand, the brass nozzle is our funnel and it creates the velocity via vortex. It was quite an effort to find data to support this till we stumbled onto your research. Before viewing the photo above, I always supposed or visualized it as a horizontal funneled vortex as is asked by Jim on 10/08/07. Anyway, I find it incredulous that as a 6th grader, my son can "prove" your theory despite lack of knowlege of any "Laws of Conservation". We shall follow your efforts. Thank-you for teaching us SO much. Tara Garcia and son, Auguste Cribbs. the principle could work with air, and indeed there are vertical axis wind turbines. There are important differences in that air is much lighter than water. This means that the gravitational influence that creates the water vortex used in Zotlöterer's design is not present in air. But for sure, an air flow can be channeled and something similar to the water vortex could be adapted to wind turbines as well. I am sure that the system would work if covered, but I would not turn it on its side, because gravity is an important part in forming the vortex and in permitting the outflow through the central opening in the bottom that in turn allows the generator to work properly. I think that for your situation (little water) you would be better off with a turbine as originally patented by Schauberger in the 20's of the last century. for sure the material for making the turbine wheel is not very important. The velocity of the vortex is not very high, so any material could do. The wheel of the Austrian is made of bent sheet metal. I am from a finance background and I am very interested in setting up a real live project using Schauberger's Jet turbine invention. Does any know if someone has done this recently? Hello Sepp I am a student at James Madison’s (ISAT) Program Located in the Shenandoah valley Virginia. The valley’s rivers have been experiencing fish kills, while our PhDs have contributed many reasons for the mass deaths of our fish and the over all unhealthiness of our rivers and streams it all boils down the oxygen levels. I wonder as to how much a vortex of the size shown on your site can oxygenate the water that passes through. Also the ISAT program is keenly interested in energy production so I must ask about patent rights and if it’s possible to work with you to come up with some solution that benefits everyone especially the fish. Thank you for your consideration Donald F Gleason Jr. I am not the inventor - merely reporting on this. A previous comment (1 July 2007) has information about the patent. I tried to contact the inventor by email (wasserwirbeltechnik at tele2 dot at) but never did get an answer. The size of the plant would depend on the water you have available. The original idea of this was oxygenation of the water of a brook. The production of power was added more or less as an afterthought. Sorry not to be of any great help about contacting the inventer. His website seems to have gone off line since I made my article. I sent an e-mail last week, but perhaps you missed it. I have some potential water sites in the UK where I want to see if I can implement Schauberger's Jet turbine invention for generating electricity. Do you have any contacts who have worked on such a project ,a dn or may be intrested in such a project. It would be fanstastic to prove Schauberger's are commercially viable. indeed I missed your email - it must have been swallowed up by the spam filters. Schauberger's Jet turbine is not an easy thing to implement. We don't have any currently running projects on this. No one worked on it seriously, that I know. Perhaps the aerator/turbine described in this article would be a more easy and immediate project to bring on line, although I do not have a communication line to Zotlöterer, who has taken out a patent on it. Information on the patent is in an earlier comment. I have sent an e-mail to Zotloterer a few weeks ago, but I have not had a reply. I will try again. Do you know if Callum Coates could provide any input on this project? I really don't have contact to Callum Coats but there's nothing to keep you from trying. In any case, apart from the possible trouble with patent rights (darn patents) the Zotloterer variant seems quite easy to duplicate and adapt to any size flow and needs hardly any altitude differential to work. I have made contact with Zoloterer, and we are looking to work with each other. What makes implementing Schauberger's jet turbine so difficult? Good you have contact, Jake. What makes Schauberger's jet turbine more difficult is that there is no currently working installation. The only record we have is the patent, but there are no parameters on how exactly to build. So there is some experimentation to be done, and no telling whether those who do the experimenting will hit it off right. At least the Zotloterer implementation has a visible working precedent. That's the difference. move into. As the water warms again along the vessel side it expands pushing the ship, as in the trout example. As to the wind turbine, it appears that wind also wants to sprial when it meets something of different density/temp, thus perhaps a tornado is a dramatic version of that. It falls frm the sky by gravity as the water from the cloud that creates it cools and densifies. Thus perhaps a wind trubine should endeavor to create a tornado by the same method: convert a temperate low density cloud at the top into a colder high density tornado at the bottom to power a turbine. I don't see anything wrong with you using the vortex idea in your area. A patent does not preclude all use of what is patented. It is merely the commercial exploitation of the idea by others that the patent protects against. So if you were to offer such plants commercially, you might be in violation of the patent. But please do get another opinion on this - I'm not a great authority. I don't have more data than what is posted and referenced in this article. can this work for treated sewage water? efficiency figures are in an earlier comment. Read up on them. I believe it would work for treated sewage water. Depending on how much altitude differential you have, the thing could even be repeated in relatively short intervals. John, What you said about ship propulsion just makes sence. Try on small model to see. The energy in a vortex seems to be one of nature's most powerful forces. Things in nature try to spin, even the very atoms in the carbon steel of your ships are in constant motion. Free energy is all around us. Good luck with the governments that do not wish to see the cart upset. Perhaps you have the clout needed to get this in the mainstream, our world is dying and needs free energy. After reviewing some of your website information I wanted to thank you for sharing your findings and encouraging others in the process. Thank you. Also if you have not seen Marko Rodin's work you may want to check it out, he helped me gain a better understanding of the vortex. Do you think a water vortex could power a pump used to supply the water flow to power the vortex? Would there be excess or overunity if the pump were of the right design? I have wanted to try that for some time as an experiment. I have run into Marko Rodin's work before, but never got a chance to go really study it. "Do you think a water vortex could power a pump used to supply the water flow to power the vortex?" Whether I think this is possible is not really the question. I know that some people have tried very hard, and that so far we do not know of anyone who succeeded. Yes, there may be rumors but not any proven technology. So I would like to reserve judgement on this one. If you do experiment and find that it works, let us know. I am not that familiar with the plant - merely reporting on it. Check out the recent interview with Franz Zotlöterer done by Sterling Allan of PES Network. Here you have something on the size of the opening. Regarding your claim: "The turbine produced 50.000 kw/h in its first year of operation." Although you write on your front page "This site provides a glimpse of emerging new paradigms in economy, physics and new energy technologies" the above sentence is still nonsense. As someone who "always had a strong interest in technical things and physics" you should know that energy is power by time therefore it's kWh not kW/h. Also notice the capitalised W.
Bitte informieren Sie sich über grundlegende physikalische Größen, bevor Sie solche Texte verfassen, sonst wird Sie niemand ernst nehmen können. Thank you for the correction. Yes, kw/h should be written kWh, meaning not kW per hour but so many hours worth of one kW during the year. I had not understood that at the time of writing the article. Can someone tell me if there is any small power generator which can be placed in running water of rivers is available in the market. If so pl. send me the address. Thanks in advance.